Get Ready for Comanche Moon! Texas-based Comanche Moon is gearing up to release their album 'Country Music Deathstar" this coming Friday 8/3/2018! 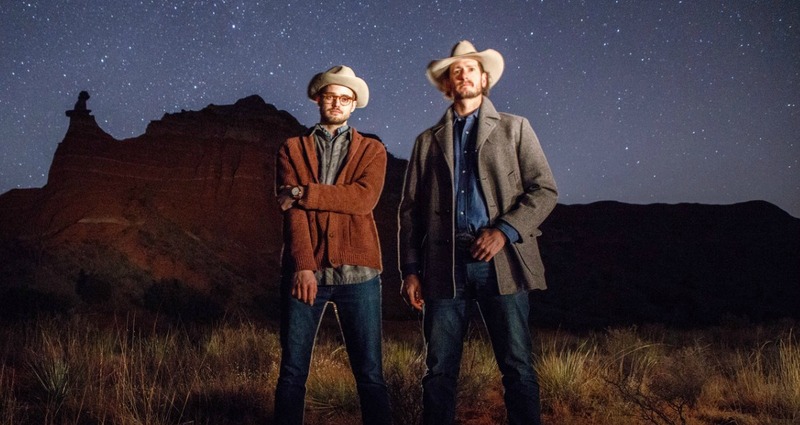 Comanche Moon is Mark Erikson and Chandler Sidwell from Amarillo, Texas and they are super excited about their upcoming release Country Music Deathstar. We caught up with them to talk about the album and all the other things happening in their world! Chandler Sidwell (CRS): When Comanche Moon first started playing music we naturally assumed we were playing “Texas Country” and billed ourselves as such. We believe our music and sound share a direct correlation with the landscape we grew up in, and that in itself means we’re a “Texas Country” band…Fairly quickly and to our surprise we kept getting met with the same two responses, “You guys are too rock n’ roll to be Texas Country,” and “You guys are too country to be rock n’ roll.” Being as stubborn as we are, we certainly weren’t going to bend one way or the other so we could fit nicely somewhere. Instead, we decided we’d record an album that expressed our interpretation of Texas music, hopefully proving that there is much more to the musical landscape of Texas than just your everyday, run of the mill country music. The title Country Music Deathstar, is a statement on challenging the pre-conceived notions of what “Texas Country” actually is while showcasing the genre-crossing musical influences of the Texas panhandle. How is this album different than past projects? CRS: Our self-titled EP we was a pretty straight forward project that we recorded in Amarillo. It was a collection of songs that Mark had written before the formation of Comanche Moon along with a couple others written in the infant stages of the band. The EP showcased our different influences on a more track by track basis which led to a lot of questions about what type or genre of music we played, with the new album we set out to create a more cohesive and complete musical theme throughout the entire track list. The theme that the Deathstar has arrived to re-define what we all know about Texas music. This was accomplished by traditional instrumentation being utilized in unconventional ways, sampling historic audio from the Library of Congress, and by interweaving the bands personal hardships into the mythology of the album. MHE: We recorded the EP at a time when we were playing as a three-piece with Chandler on drums, Carlos on bass and me on guitar. We were playing a lot more straight up rock and roll at that time. We didn’t have much of a plan or much of a budget, so we just went into a recording studio in Amarillo and recorded five of the songs that we had. What we came out with was three rock songs and two country/folk songs without a lot of blending. One of the main differences is that we put a lot of thought into putting out an album as an album—one cohesive work rather than just a bunch of songs. We spent a lot of time talking about instrumentation, feel, flow, what we wanted to say musically with the record. As cliché as it is to say this, we wanted it to be a journey. How do you think you’ve grown as artists since the last studio release? MHE: Good Lord, I hope so! Yes. We spent a lot of time since the last release thinking about who we were as a band, what our sound is and where we wanted to place ourselves within the modern music landscape. Individually, we’ve grown as musicians—if you play for two and a half years and you’re the same musician you were two and a half years ago, then what are you doing? Personally, as a songwriter, I’ve gotten more comfortable writing songs that I didn’t used to be comfortable with; more personal songs. I’m a pretty private person and I grew up in a culture that didn’t believe in talking about feelings. I think that was an impediment to me as a songwriter and it took some time to get past that. CRS: Well, we like to describe the process of recording our first full length album as, “trial by fire.” We had scheduled multiple start dates for the recording process at Yellow DOG studios but were continuously delayed by outside life events (family tragedy, destructive wild fires). It was the third re-scheduled date that actually stuck and by that point we felt like we’d been drug through the dirt and weren’t in the most conducive mindset to record an album, but once the process began it was clear it was as much cathartic as it was creative. After going through so much and still getting the album done the “trial by fire” mentality became more of a mantra that we’ve carried into every gig. No matter the circumstances we know we can still it done, whatever “it” may be. Is there one inspiration, theme or feeling that permeates this new album? CRS: Change. We set out to change what people perceived as Texas Country music, but by the end of it the theme had more to do with us and our lives than with the music. The theme presents itself in “Restoration” a track about Mark’s experience losing his childhood home and ranch to wildfires. It’s again present in “Going to the Country”, a song about burning out at a desk job and yearning for the healing properties of the great outdoors. I think we initially were so focused on the music during the recording process that we failed to appreciate how much we were all changing and growing individually. We’re an independent act recording our so to say we we’re naïve about all that goes into making an album is an understatement, but by the end we had our album and we were a better band by the end of it because of all the challenges. MHE: Yeah, I think Chandler hit it on the head. Change, dislocation, dissatisfaction, restlessness. I think we were focusing so much on weaving the musical tapestry that we never realized that there was actually this strong lyrical theme that ran through the whole album. I think we were actually in the studio and Tim, our producer, pointed that out. I didn’t set out to write songs like that, I guess that’s just what bubbled up. Even the one that I didn’t write, Colorado Bound (written by my friend, Dustin Brown), is on-theme. It sort of got me thinking about what was happening in my life over the period of time that I was writing songs for this album. You can listen to three tracks below from the upcoming album and pre-order Country Music Deathstar HERE.